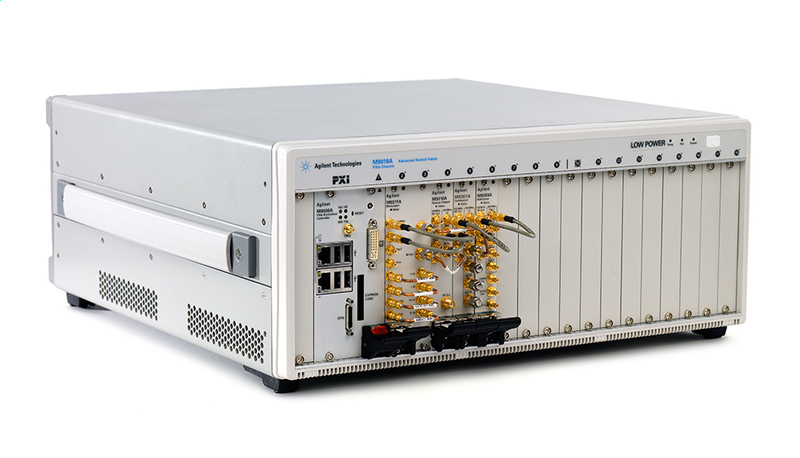 Agilent Technologies Inc. (NYSE: A) has recently introduced the world's fastest vector signal generator in a PXI form factor. The Agilent M9381A is a 1-MHz to 3- or 6-GHz VSG that combines fast switching and excellent RF parametric performance: high output power, linearity and superior level accuracy, outstanding adjacent channel power ratio performance (for output levels up to +10 dBm or more) and wide modulation bandwidth (up to 160 MHz) for testing RF devices. Agilent designed the M9381A for applications such as testing and validating the design of wireless power amplifiers and transceivers, public safety and military radios, and cellular base stations (primarily picocell and femtocell). The new PXIe VSG does more tests in less time, which reduces the cost of testing. Agilent's exclusive baseband-tuning technology innovation enables frequency and amplitude switching speed as fast as 10 µs in list mode and 250 µs from its programming interface. The switching speed is further enhanced by excellent linearity and repeatability associated with Agilent's signal generators. The versatile list mode helps increase speed and provides flexibility by allowing engineers to change 80 parameters, including frequency, power and modulation in as many as 3,201 list mode points. This enables engineers to meet a wide variety of test requirements while improving test throughput. Engineers can use the Agilent M9381A VSG to test wideband power amplifiers, front-end modules, transceivers and more, at standard 40 MHz RF bandwidth or options of 100 MHz or 160 MHz bandwidth with real-time corrections and ±0.1, ±0.2, and ±0.3 dB flatness, respectively. The M9381A, with its excellent modulation quality at high output power, can be used at power levels up to +10 dBm or more depending on the standard with little degradation to adjacent channel power ratio performance. This enables engineers to directly operate at the required power levels without additional amplification to compensate for test system losses. The M9381A delivers ACPR of up to -70 dBc (W-CDMA test model 1, 64 DPCH). The output power up to +19 dBm can be controlled precisely with accuracy of ±0.4 dB. "The M9381A is the first PXI vector signal generator that delivers the speed and accuracy needed to reduce the cost of test in modern communication manufacturing," said Mark Pierpoint, vice president and general manager of Agilent's Software and Modular Solutions Division. The Agilent M9381A PXIe vector signal generator simulates complex real-world communications signals through Agilent's Signal Studio software. Signal Studio is a flexible suite of signal-creation tools that offers performance-optimized reference signals validated by Agilent to support standards such as LTE and 802.11ac. Agilent's unique and industry-leading calibration core exchange strategy maximizes system uptime by providing fast repairs. The M9381A PXIe vector signal generator is the latest addition to Agilent's growing lineup of more than 60 PXI and AXIe modular products.